April 2018 in Newbies Demo Area - for those who want to test the waters! 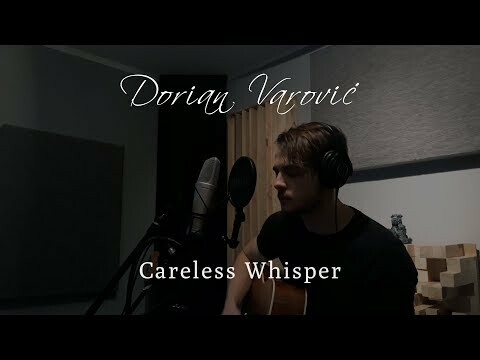 I did an acoustic cover of George Michael's Careless Whisper. With a slight arangement twist. Instead of the sax we added piano to fill in the gaps and personally I think it fits in well. But it's also up to you beautiful people to decide. I would love to get some feedback on the singing part aswell as the whole song cover in general. You have a nice sound to your voice. The lower end could use a little more support. Right before the break you try to go up in the chest voice, but wavered a little bit, but the song as a whole sounded nice. The recording sounded good, but was missing a low end instrument. The guitar,vocals, and piano pretty much run along the same frequency pattern so I would have added a bass, cello, and maybe a shaker for the background to add a little more depth. Dorian, it sounded quite nice! Hey Tony, thanks so much! Honestly, I completely agree. I was so focused on making the verses sound "lighter" and to let vocals open up to the chorus I kinda lost that color that I normally have I'd say haha. As for the recording, yea, it most definitely would make a even more of a difference, but my thought process was that I wanted to keep it really simple sounding and give a more "relaxing feel" to it. Also, do you feel like I should of sang the chours with light head? If so, I tried that, was pretty flat and falsetto like sounding. But I believe that's just a result of not constantly practicing and having enough of stamina to support it. Mix around F4-ish to H4 is where it's a lot of breaking and something that I really need to work on. Any tips? Thank you! Would you mind going a bit more into depth about the consonants? English is not my native tounge so there's quite a bit of accent in my singing. Even though I've been learning and using English for last 14-15 years it still is quite there and noticeable haha. I always focused more on pronunciation of certain vowels and trying mask and shift it so I can get my throat to open up more. But I've never thought about the others. The choruses sounded really good. I would leave them as is. The recording suggestions were just that, suggestions. Beauty is in the ear of the beholder, but we are mainly here for the singing, and you don't seem to have much trouble with that other than what I pointed out. @dvarovic, by consonants, I mean the hard-sounding letter sounds. Try to soften them down with vowel mods, maybe something like: " khaaah-lesss whispahhhs of a close friennnn"
On the forum, search vowel mods/modifications here on the forum, and you understand what I mean.